We are extremely proud to say that, to date, K-Seal is the only product to have been successfully tested by the equipment at Brighton University and classes as meeting the demands of ASTM D3147. It was also confirmed that there was no presence of particles, gumming or gelling in the 0.85mm mesh tests. Meaning there’s no risk of K-Seal causing other problems in your engine when applied – simply shake, pour and go! The only standard in the world that specifies what a product that seals engine coolant leaks should and should not seal is called “Standard Test Method for Testing Stop-Leak Additives for Engine Coolants”, or ASTM D3147 for short. As of 2015, the only independent academic facility in the UK or USA that has the ability to test products to ASTM D3147 is Brighton University Engineering Division which, in a joint project with K-Seal which was supplemented by funding from the government, has been able to commission, build and run the necessary test equipment. A test rig that simulates an engine’s cooling system has to be built to specific measurements set out in the standard’s conditions. It has to be controlled extremely precisely in order for tests to be repeated with the specified conditions replicated exactly the same way every time. For instance, temperatures, water flow and pressure rates need to be exactly the same, and holes and slots need to be the same sizes. In fact, the holes have to be prepared by a specialist engineering firm who can guarantee accuracy at such a tiny diameter. What conditions does a stop leak product have to meet? This represents a severe leak which drain the system of coolant in about twenty minutes. This simulates a crack and tests whether the product can seal longer areas of damage. This applies both before and after running through a hot cooling system, ensuring that the product will not clog narrow waterways unnecessarily. 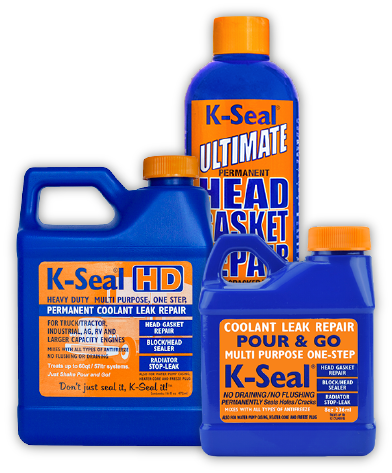 An ASTM D3147 classification means you can use K-Seal safe in the knowledge that it does exactly what it says on the bottle: seal holes in your coolant system and cracks in your head gasket, with ease. That means stopping leaks and preventing costly repairs to get you back on the road, fast.